The Phoenix Police Department set a new record last month and—it was not for the cutest lip sync challenge. PPD officers have shot 31 citizens this year, tying the record set for shootings in one year, and it is only August! The officer-involved shooting record will undoubtedly be broken, and soon, if the law of averages holds true. Phoenix city leaders are concerned, even commissioning a new study to investigate why the number of officer-involved shootings has seemingly skyrocketed past previous years. Following the previous record of 31 shootings that was set in 2013, an Arizona State University study was undertaken to examine the phenomena and according to AZ Central, called for “reform and enhanced training” for officers. Such training, as The Free Thought Project has advocated, should include de-escalation training which all Salt Lake City, Utah officers attended. As we previously reported, officer-involved shootings in Salt Lake have plummeted to near zero. AZ Central compared the shootings in Phoenix with two other similar in size metropolitan areas: San Antonio and Philadelphia, both with 1.5 million residents. To date, San Antonio has only seen eight officer-involved shootings, while Philadelphia has a mere four. The 31 shootings by law enforcement officers in Phoenix is almost four times as many as San Antonio and is over seven times as many as Philly. Making matters difficult to study, there exists no mandatory reporting by law enforcement agencies to a national database of officer-involved shootings—an implementation which could shed light on when such shootings occur as well as their causes. From such data, preventative measures could be put in place to ensure officer safety as well as the safety of the general public on the other side of the sights of police firearms. For now, Phoenix city leaders await the findings of the research study recently approved, as officer-involved shootings across Maricopa County continue to climb. As we were writing this story, another officer-involved shooting occurred in Phoenix late Tuesday afternoon. Maricopa County’s officer-involved shootings have even surpassed those of Los Angeles. Something is definitely wrong in Phoenix, and unfortunately, we proclaim the glaringly obvious. Police in Phoenix are shooting people in record numbers, no one knows why, and no one is doing anything about it, except spending taxpayer money to study what some residents already know. 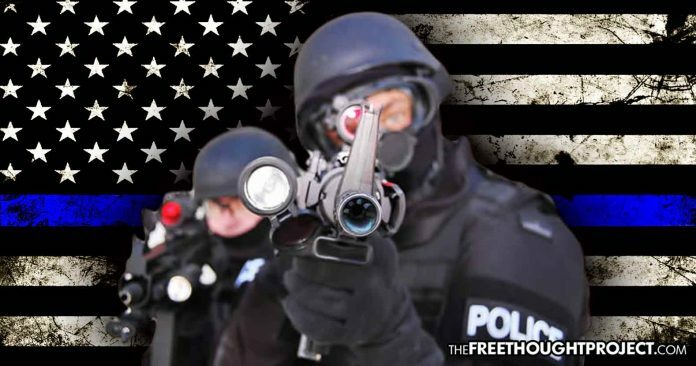 Officers do not face consequences if they open fire on innocent citizens, they have qualified immunity, and when they are charged with murdering someone, they can get away with it scot-free. In December 2017, Mesa PD officer Phillip Brailsford was found not guilty of killing a Walmart pest exterminator, Daniel Shaver, at La Quinta Inn after Shaver begged for his life, and was forced to crawl on his hands and knees, and was shot and killed for reaching back to pull up his shorts, which were falling down. Someone reportedly called 911 after seeing Shaver with his air rifle inside the hotel, a rifle he did not have at the time he was shot dead in the hotel hallway. Mesa is also in Maricopa County. The likely message sent to all of the county’s officers, after Brailsford was found not guilty, is ‘there’s nothing you can do and not get away with, even killing someone in cold blood.’ Such a message sent in 2017 is now being followed by record-setting police shootings in Phoenix in 2018. How high the police shootings will go once we get to the end of 2018 is anyone’s guess. But right now, there’s no end in sight. Calls for a Citizen Review Board of such shootings failed miserably in 2017. As TFTP has reported, when police departments investigate themselves, with respect to officer-involved shootings, they predictably come to the conclusion (more times than not) that their officers did nothing wrong. Wisconsin is the only state in the union whereby officer-involved shootings are investigated principally by outside agencies.